West Virginia today is mostly an erosional plateau carved up into steep ridges and narrow valleys, but 300 million years ago, during the Carboniferous Period, it was part of a vast equatorial coastal swamp extending many hundreds of miles and barely rising above sea level. This steamy, tropical quagmire served as the nursery for Earth's first primitive forests, comprised of giant lycopods, ferns, and seed ferns. North America was located along Earth's equator then, courtesy of the forces of continental drift. The hot and humid climate of the Middle Carboniferous Period was accompanied by an explosion of terrestrial plant life. However by the Late Carboniferous Period Earth's climate had become increasingly cooler and drier. By the beginning of the Permian Period average global temperatures declined by about 10° C.
Interestingly, the last half of the Carboniferous Period witnessed periods of significant ice cap formation over polar landmasses-- particularly in the southern hemisphere. Alternating cool and warm periods during the ensuing Carboniferous Ice Age coincided with cycles of glacier expansion and retreat. Coastlines fluctuated, caused by a combination of both local basin subsidence and worldwide sea level changes. In West Virginia a complex system of meandering river deltas supported vast coal swamps that left repeating stratigraphic levels of peat bogs that later became coal, separated by layers of fluvial rocks like sandstone and shale when the deltas were building, and marine rocks like black shales and limestones when rising seas drowned coastlands. Accumulations of several thousand feet of these sediments over millions of years caused heat and pressure which transformed the soft sediments into rock and the peat layers into the 100 or so coal seams which today comprise the Great Bituminous Coalfields of the Eastern U.S. and Western Europe. Earth's climate and atmosphere have varied greatly over geologic time. Our planet has mostly been much hotter and more humid than we know it to be today, and with far more carbon dioxide (the greenhouse gas) in the atmosphere than exists today. The notable exception is 300,000,000 years ago during the late Carboniferous Period, which resembles our own climate and atmosphere like no other. With this in mind the road to understanding global warming and our present climate begins with an historical journey through a chapter in Earth's history, some 30 million years before dinosaurs appeared, known as the Carboniferous Period-- a time when terrestrial Earth was ruled by giant plants and insects, and glaciers waxed and waned over a huge southern continent. An intriguing story of climate change is recorded in the rocks which comprise the geological formations laid down during the Carboniferous Period. Coal deposits play an important role in this record. Coal is mostly carbon accumulations from fossil plant material deposited in swamps so devoid of oxygen that bacteria and other critters couldn't survive to feed on their remains. The explosion of luxuriant plant growth and coal bed formation that occurred 286 - 360 million years ago is the reason for the name, "Carboniferous Period." The first half is called the "Mississippian Period" and is characterized by deposition of mostly thick marine limestones in shallow, tropical seas. The last half of the Carboniferous is called the " Pennsylvanian Period," and contains mostly sediments and coal seams created by meandering river deltas periodically interrupted by marine inundations. Many places around the world contain important coal beds deposited during this time period. In West Virginia the various coal seams have each been given their own unique names: like Pocahontas, Sewell, Eagle, or Coalburg. There are subtle but noticeable changes in the character and properties of the coal beds throughout the Pennsylvanian Period, most likely due to Earth's cooling climate and quite possibly also due to declining atmospheric carbon dioxide concentrations. Early Pennsylvanian coal seams like those found in the Pocahontas and New River Formations were characteristically friable, shiny, and "vitreous," indicating deposition in a continuously wet, humid environment. In contrast, coals of the Allegheny Formation that followed (Middle Pennsylvanian) are predominantly hard, dull, and "splinty," indicating that by then the climate had already become drier, most likely cooler, and generally a more stressful place for terrestrial plant life. The Coalburg and Stockton seams, deposited around 307-305 million years ago, mark the geologic boundary at which a shift from tropical to temperate climate appears to have occurred. The Kanawha Formation, represents deposition in a transitional climate, with coal seams containing alternating layers of vitreous and splinty layers, called "banded coals." Average global temperatures in the Early Carboniferous Period were hot- approximately 20° C (68° F). However, cooling during the Middle Carboniferous reduced average global temperatures to about 12° C (54° F). As shown on the chart below, this is comparable to the average global temperature on Earth today! Similarly, atmospheric concentrations of carbon dioxide (CO2) in the Early Carboniferous Period were approximately 1500 ppm (parts per million), but by the Middle Carboniferous had declined to about 350 ppm -- comparable to average CO2 concentrations today! Earth's atmosphere today contains about 380 ppm CO2 (0.038%). Compared to former geologic times, our present atmosphere, like the Late Carboniferous atmosphere, is CO2- impoverished! In the last 600 million years of Earth's history only the Carboniferous Period and our present age, the Quaternary Period, have witnessed CO2 levels less than 400 ppm. Late Carboniferous to Early Permian time (315 mya -- 270 mya) is the only time period in the last 600 million years when both atmospheric CO2 and temperatures were as low as they are today (Quaternary Period ). See an estimate of CO2 concentrations over the past 15,000 years, based on plant stomata. There has historically been much more CO2 in our atmosphere than exists today. For example, during the Jurassic Period (200 mya), average CO2 concentrations were about 1800 ppm or about 4.7 times higher than today. The highest concentrations of CO2 during all of the Paleozoic Era occurred during the Cambrian Period, nearly 7000 ppm -- about 18 times higher than today. The Carboniferous Period and the Ordovician Period were the only geological periods during the Paleozoic Era when global temperatures were as low as they are today. To the consternation of global warming proponents, the Late Ordovician Period was also an Ice Age while at the same time CO2 concentrations then were nearly 12 times higher than today-- 4400 ppm. According to greenhouse theory, Earth should have been exceedingly hot. Instead, global temperatures were no warmer than today. Clearly, other factors besides atmospheric carbon influence earth temperatures and global warming. 2) the existence of a large (south) polar landmass capable of supporting thick glacial ice accumulations. These special conditions existed during the Carboniferous Period, as they do today in our present Quaternary Period. Climate change during the Carboniferous Period was dominated by the great Carboniferous Ice Age. As the Earth alternately cooled then warmed, great sheets of glacial ice thousands of feet thick accumulated, then melted, then reaccumulated in synchronous cycles. Vast glaciers up to 8,000 feet thick existed at the south pole then, moving from higher elevations to lower, driven by gravity and their tremendous weight. These colossal slow-motion tidal waves of ice destroyed and pulverized everything in their path, scraping the landscape to bare bedrock-- altering mountains, valleys, and river courses. Ancient bedrock in Africa, Australia, India and South America show scratches and gouges from this glaciation. Earth's continents during the Carboniferous Period were arranged differently than they are today. South America, Africa, India, Australia, Antarctica, and a few minor pieces were joined together near the south pole to comprise the supercontinent known as Gondwanaland. Gondwanaland was a formidable polar landmass. While ice caps and glaciers can't grow large over open oceans, they can and do attain great thickness over polar continents-- like Gondwanaland. Although cycles of glaciation are believed to occur in response to solar input variations like the Milankovich Cycle and Precession of the Equinoxes, another important factor is the rearrangement of continental landmasses over geologic time by the processes of continental drift. Throughout the Carboniferous Period, continental drift was rearranging most (but not all) of the Earth's landmasses into a single supercontinent stretching from the south polar region to the north polar region. Although the precise mechanisms involved are still a matter of debate this appears to cause regional humidity changes and redistribution of ocean currents which in turn promote ice accumulation and glacier formation over the earth's polar continents. These glacial ice caps grow larger during periods of reduced solar input, and because ice caps are very good solar reflectors this tended to accelerate and perpetuate cyclical relapses to global cooling. Basically, Earth undergoes alternating periods of ice ages and warming whenever a continuous continental landmass extends from one polar region to the other while at the same time there exists a large polar continent capable of supporting thick ice accumulations. These conditions existed 300 million years ago during the Carboniferous Period as they do for the Earth today. However for most of geologic history the distribution of the continents across the globe did not satisfy this criteria. Continental drift continually rearranges the continents, moving at rates of only a few centimeters per year. We are actually in an ice age climate today. However for the last 10,000 years or so we have enjoyed a warm but temporary interglacial vacation. We know from geological records like ocean sediments and ice cores from permanent glaciers that for at least the last 750,000 years interglacial periods happen at 100,000 year intervals, lasting about 15,000 to 20,000 years before returning to an icehouse climate. We are currently about 18,000 years into Earth's present interglacial cycle. These cycles have been occurring for at least the last 2-4 million years, although the Earth has been cooling gradually for the last 30 million years. Over the past 750,000 years of Earth's history, Ice Ages have occurred at regular intervals, of approximately 100,000 years each. Floating atop a mantle of hot, ductile rock, the continents and ocean plates drift like gargantuan icebergs, crashing into each other, building mountain ranges and volcanic belts as they go. The phenomena is known as continental drift and the process has been going on for hundreds of millions of years-- at rates measured in only a few centimeters per year. Illustrated above is how geologists believe Earth's landmasses were arranged 306 million years ago, during the Late Carboniferous Period. Many of the continents we know today were recognizable then-- some more easily than others. Parts of them were either under water or hadn't been assembled yet, and almost all were part of one of two larger landmasses known as Gondwanaland and Laurasia. Antarctica, Africa, Arabia, India, Ceylon, Australia, New Zealand and South America together comprised Gondwanaland. It was positioned near the south pole, and during the Late Carboniferous Period was largely buried under large sheets of glacial ice. Europe, Greenland, Siberia, North America, Kazakhstan, and N.China together comprised Laurasia. It was still adding real estate to itself throughout the Carboniferous and into the Permian Period. Pangea (Greek for "all lands") is the "supercontinent" created when these two giant landmasses drifted into one another, a process that was complete by the middle of the Permian Period. Later, during the Jurassic Period, the Pangean Supercontinent began to break up and the separate continents once again drifted apart-- a process which continues today. During Late Carboniferous time the continent of North America lay much further south than it does today. North America and parts of Europe were in the tropics. The equator stretched from central Colorado to Nova Scotia and also from Great Britain to the Ukraine. A broad Central Pangean mountain range formed an equatorial highland that during late Carboniferous was the locus of coal production in an equatorial rainy belt (1). This produced vast amounts of sediments which were transported to equatorial coastal regions, forming deltas which supported vast coal swamps. Throughout the Late Carboniferous (Pennsylvanian) Period, Pangea drifted northward to drier, cooler climates and by the mid-Permian North America and Northern Europe had become desert-like as continued mountain-building caused much of the interior of the vast Pangean Supercontinent to be in rain shadow. The Great Bituminous Coalfields of the Eastern U.S., Europe, and Northern China were primarily deposited during the Upper Carboniferous Period, attesting to the fact that even in the cold, icehouse climate of the Carboniferous Period lush vegetation still persisted in the world's tropical and cool temperate regions. The map projection below shows the general worldwide distribution of many of the significant coal deposits of the Late Carboniferous. During the Upper Carboniferous Period (a.k.a. Pennsylvanian Period: 286 - 320 mya) nearly all the continents were joined as one giant landmass called Pangea (meaning "all lands"). While massive glaciers existed at the south pole, tropical swampland forests along the equator produced vast peat beds which after deep burial and subsequent heat and pressure were transformed into the Great Bituminous Coalfields of the eastern U.S and western Europe. Warm to moderate temperatures and high humidity alone do not produce all the conditions necessary for creating coal deposits. Steadily rising sea level and/or steady regional swamp subsidence are also necessary. As a prerequisite to the formation of thick coal seams it is necessary that the rate of vegetable matter accumulation remain in general equilibrium with the rate of rising water levels for relatively long periods. Rise too fast, and the swamp gets drowned, rise too slowly and dead plant material is not completely submerged when it falls to the swamp floor where it will rot or oxidize rather than be preserved. Eustatic or global sea level fluctuations were common and regular throughout the second half of the Carboniferous Period. Coal seams are found in layers alternating between marine and non-marine rocks, indicating cycles of coastal transgressions and regressions played an important role in coal formation. The Carboniferous-age rocks of the Eastern U.S. and Europe record regular cycles of advancing and retreating seas; where beds of coal, shale, limestone, and sandstones were deposited in more or less repetitive sequences. These sequences, called cyclothems, have been well-documented, particularly during the Late-Upper Carboniferous. Although several factors influenced the timing and distribution of these cyclothems, it is generally believed that cycles of rising and subsiding sea levels were the primary cause. These changes appear to have been global in scope--brought about by repetitive cycles of ice expansion, then ice melting, during the Carboniferous Ice Age. Although most of the Carboniferous-age coal seams of West Virginia are on average less than 4 feet in thickness, they occasionally can be as thick as 25 feet. 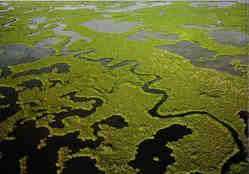 The bituminous coal beds of North America and Europe were laid down in swamps along coastal environments which are often dominated by meandering river deltas. Because these deltas were always moving and changing, the distribution and thickness of individual coal beds tend to be variable,--sometimes erratic. Coal seams are often comprised of distinct, mappable benches which laterally thicken and thin, merge and split apart, and often vary in physical properties like ash and sulfur based on their proximity to channel systems and marine shorelines at the time of deposition. There are many areas in the coalfields which contain few minable coals or no coals at all. But for the most part individual seam horizons are remarkably persistent along great horizontal distances. So much so that the geologic formations of this time period are often best correlated by using the coal seams themselves as "marker beds." When conditions were right, accumulating dead plants formed peat beds which after burial were subjected to heat and pressure as additional sediment layers continued to accumulate and add weight. Several thousand feet of sediments were added during the geologic ages that followed. In the Appalachian Region, most of this rock overburden was subsequently removed by erosion. During deep burial the peat undergoes coalification which squeezes out up to 98% of the water and some of the volatile hydrocarbons. The older and more deeply-buried a coal seam is the less water and volatile matter it contains. The ratio of fixed carbon to volatile matter is used to determine a coal's rank. The higher the ratio, the higher its rank. The lowest rank of coal is peat. Next comes lignite, then sub-bituminous, bituminous, and in tectonically active regions-- anthracite. Coal beds of the Carboniferous Period are almost all ranked bituminous, or higher, because of their great age and the great burial depth and moderate tectonic forces that were applied since their deposition. A bituminous coal bed 1 ft. thick may have required as much as 7-10 ft. of peat thickness to start with. The process of peat accumulation continues until terminated by an event like an invasion of a nearby river channel, a marine transgression, or unfavorable climate. Each time shorelines retreated coal swamps migrated with them, along vast deltas which received seemingly limitless supplies of sediment from the emerging Pangean mountain range to the southeast. Although these highlands may have rivaled the Himalayas in relief, they are now completely gone-- eroded down to nothing by the relentless forces of wind and rain over geologic time. Thanks to the Carboniferous Ice Age, and continental drift, coal occurs in relative abundance, and is mined today for a variety of energy, manufacturing, and medicinal purposes. Today the Earth warms up and cools down in 100,000- year cycles. Geologic history reveals similar cycles were operative during the Carboniferous Period. Warming episodes caused by the periodic favorable coincidence of solar maximums and the cyclic variations of Earth's orbit around the sun are responsible for our warm but temporary interglacial vacation from the Pleistocene Ice Age, a cold period in Earth's recent past which began about 2 million years ago and ended (at least temporarily) about 10,000 years ago. And just as our current world has warmed, and our atmosphere has increased in moisture and CO2 since the glaciers began retreating 18,000 years ago, so the Carboniferous Ice Age witnessed brief periods of warming and CO2-enrichment. Following the Carboniferous Period, the Permian Period and Triassic Period witnessed predominantly desert-like conditions, accompanied by one or more major periods of species extinctions. CO2 levels began to rise during this time because there was less erosion of the land and therefore reduced opportunity for chemical reaction of CO2 with freshly exposed minerals. Also, there was significantly less plant life growing in the proper swamplands to sequester CO2 through photosynthesis and rapid burial. It wasn't until Pangea began breaking up in the Jurassic Period that climates became moist once again. Carbon dioxide existed then at average concentrations of about 1200 ppm, but has since declined. Today, at 380 ppm our atmosphere is CO2-impoverished, although environmentalists, certain political groups, and the news media would have us believe otherwise. What will our climate be like in the future? That is the question scientists are asking and seeking answers to currently. The causes of "global warming" and climate change are today being popularly described in terms of human activities. However, climate change is something that happens constantly on its own. If humans are in fact altering Earth's climate with our cars, electrical powerplants, and factories these changes must be larger than the natural climate variability in order to be measurable. So far the signal of a discernible human contribution to global climate change has not emerged from this natural variability or background noise. Understanding Earth's geologic and climate past is important for understanding why our present Earth is the way it is, and what Earth may look like in the future. The geologic information locked up in the rocks and coal seams of the Carboniferous Period are like a history book waiting to be opened. What we know so far, is merely an introduction. It falls on the next generation of geologists, climatologists, biologists, and curious others to continue the exploration and discovery of Earth's dynamic history-- a fascinating and surprising tale, written in stone.